Treasury Secretary Steven Mnuchin cheers dark money. Photo credit: DonkeyHotey / WhoWhatWhy (CC BY-SA 2.0) See complete attribution below. Last week, the Trump administration took a major step toward helping one of society’s most vulnerable groups: politically active billionaires. Although these oligarchs admittedly have vast fortunes at their disposal, politicians across all levels in their back pockets, and armies of lawyers on their side, they still had to comply with pesky reporting requirements when funneling millions of dollars to political organizations that do their bidding. But the “drain the swamp” administration put a stop to that. On July 16, Treasury Secretary Steven Mnuchin announced that some tax-exempt — yet overtly political organizations — like the National Rifle Association (NRA) no longer had to identify their big money donors to US tax authorities. There’s a good chance that the date of the announcement was carefully chosen. It was the same day that Mnuchin’s boss was in Helsinki for his performance review with Russian President Vladimir Putin. You don’t have to be a political wizard to understand that this would allow the administration to sneak this change past the media and the public. Unfortunately for Mnuchin, the Department of Justice didn’t cooperate. Because it also chose this day — in this case more out of necessity — to indict Russian national Maria Butina for acting as an unregistered agent for her country. Among the things she is accused of is setting up back channels to groups like the NRA, which is being scrutinized for potentially having laundered Russian money and helping Donald Trump win the 2016 election. That highlighted the ridiculousness of Mnuchin’s assertion that less disclosure is needed. In Washington-speak, “unnecessary regulatory burden” is the code conservatives use when they want to make it easier for corporations to screw over regular Americans. They never say this, of course, or admit who this is really for. The Treasury Department said that, among the groups that would benefit from this change are volunteer fire departments, local chambers of commerce, veterans groups, and community service groups. Mind you, the change only affects the disclosure of donor information above $5,000, so the number of fire departments and local soup kitchens that will be affected is probably very small. And who would object to disclosing having donated to one of those groups? Let’s not kid ourselves: while there may be some progressive organizations that will no longer have to report their big donors — but would hopefully not mind doing so for the sake of transparency — this new rule primarily benefits conservative groups backed by people like the Koch brothers who want to shape the country according to their ideology — but from the shadows. Heaven forbid that Americans understand what the Koch brothers, Mercers, and the like are actually up to. They might then fight back by boycotting their products. Not surprisingly, the decision was applauded by Republicans, who are the primary beneficiaries of dark money. In other words, he is worried that those powerless billionaires get yelled at by the same peasants whose voice they want to silence with massive political contributions. On the other side of the debate, you have transparency advocates who are concerned that the new change would make it much more difficult for the government to recognize when foreign countries are attempting to hijack the US political process. While Wyden’s heart is in the right place, he clearly misunderstood the motivation for Mnuchin’s decision. Making the US less democratic is not some byproduct of the new policy — it is its purpose. Because in the end, it doesn’t matter to the administration whether the oligarchs that will benefit from this change are Russian or American — as long as they help keep the GOP in power. 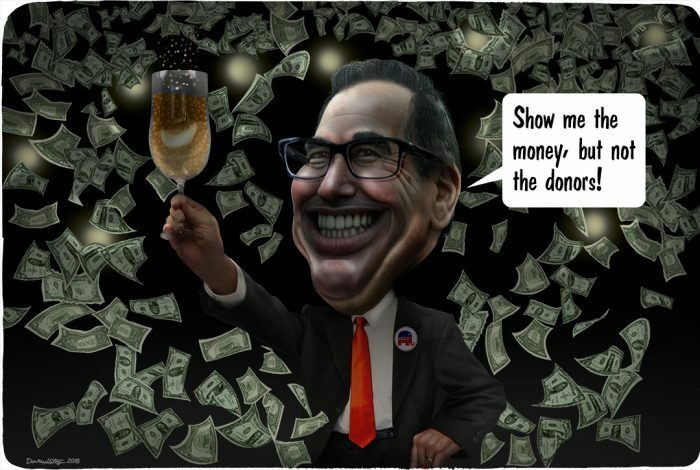 The cartoon above was created by DonkeyHotey for WhoWhatWhy from Steven Mnuchin caricature (DonkeyHotey / Flickr – CC BY 2.0). Related front page panorama photo credit: Adapted by WhoWhatWhy from US Treasury seal (US Treasury / Wikimedia) and 990 schedule b form (IRS).